But that is not to say that the opposite is also true. Sometimes the competitiveness and the zeal of athletes lead them to gambling. Some win, but most lose big money! Today we will reveal the true gambling stories of some legendary athletes that have dealt with high stakes in or outside the field. The career of the sport’s GOAT has been full of gambling stories. While he has been so successful in the game, the stories related to gambling mostly revolve around losing. 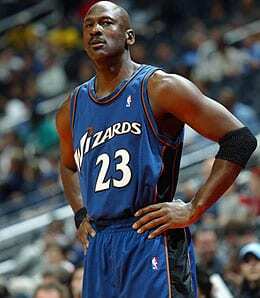 In 1993, Jordan had a game in Atlantic City against the Knicks. Just the night before the game he went on a gambling spree which cost him $165,000 in losses. That seems like quite a huge amount to lose but there’s another rumour which turned up in 2007. During the NBA All-Star weekend, Jordan apparently lost around $5 million just by playing craps. Of course, the news was revealed by Adam “Pacman” Jones, the Cincinnati Bengals cornerback known for getting into plenty of trouble of his own, so consider the source. It’s not as if Jordan was going to talk about it; hell, even when he played, he wouldn’t talk to his local media (see video below). San Diego businessman Richard Esquinas claims that Jordan owes him $1.25 million after losing a bet in a round of golf. Maybe Jordan was better off gambling at places where you can win big like Euro Palace casino! The name Pete Rose remains high in circulation whenever someone raises the scandals of sports gambling. The baseball player was banned from the game in 1989 for match fixing and had to undergo treatment for gambling addiction. He was charged of betting against his team while he was playing and managing the side. According to reports, each day he wagered around $10,000! Rose did not accept the charges and instead vowed that he bet on the Reds every day. He was even cleared of any charges by the controversial Dowd Report. But many years later John Dowd did reveal that Rose wagered against his team. The acts have also made Rose the only living person who can never be eligible for the Baseball Hall of Fame, despite the fact he accumulated more hits than any player in the history of the game. But it’s the hits off the field the game took because of him that cannot be overlooked. Barkley is one former NBA player that has involved himself in high stake betting many times over the years. Maybe he derived his inspiration from his close friend Jordan who himself had gambling problems, as we outlined above. Sir Charles apparently lost $10 million in 2006 on his gambling rounds which included $700,000 on Super Bowl weekend and $2.5 million spent on blackjack. And he took only six hours to lose that amount! In 2008, Barkley was sued by the Wynn in Las Vegas for outstanding payments of $400,000. He had admitted that gambling had become a problem for him and finally declared that he would give it up. But going by Barkley’s habits, it seems doubtful that he can give up gambling. Maybe he is spending his time online playing at Euro Palace casino. Don’t get disheartened by the losses of these athletes. You can try slots for free before you deposit and see how your luck turns out! Now it’s your turn. Let us know in the comments below what your favourite gambling athlete story is. This Australian veteran has the right Spurs mentality — sacrificing for the greater good, so you didn’t hear any moaning when injuries and team depth saw him take a back seat last season after looking like he was on the cusp of a breakout in 2013-14. This season, however, Mills is seeing more action than ever, so he needs to be on the radar of owners in deeper leagues as a solid backcourt depth option. This week, at the very least, he may make for a solid pickup in standard sized leagues, too. He’s been massively inconsistent and the free agent to be could be nearing the end of his Lakers’ career. However, Johnson’s recent play may give LA pause to think about bringing him back next season. He’s been logging a big load lately, and while his shooting leaves something to be desired, Johnson has reached double digit points in four of the last five (including a team-high 16 on Sunday), while canning plenty of treys and pitching in with more boards than usual (although, overall, his rebounding is down slightly after averaging a career-best 4.4 last season). Centre is one of the toughest positions to fill in Fantasy basketball, so you definitely don’t want to wait too long before grabbing your first. Also, in the case of the myriad C/PF eligible players, check your league to ensure that your big man actually qualifies at centre, or else you could wind up in serious trouble. What you’re focusing on here is the big-time rebounders and shot blockers. If you don’t land a centre that can anchor your team in this category, you’re really going to be scrambling to fill that gap — especially in H2H leagues.